In “Resources to Help You Create an Effective Employee Handbook,” we identified key resources to help you create an employee handbook. Now, we cover why you need one and how to create it. Whether your small business has two employees or 20, you will have certainly created workplace policies, procedures or expectations, either formally or informally. It's essential that your employees know and understand these policies — because you'll run a more effective organization if they do and because you don't want to risk having your company break federal or state laws. An employee handbook is a compilation of all your company's policies and protocols, as well as employees' legal rights and obligations. Having an employee handbook makes it easy for you to communicate rules and responsibilities to employees, so there's no question about what's expected from them — or from you, as the small business owner. Moreover, a comprehensive employee handbook helps protect your business legally if anyone ever questions whether you've clearly communicated your policies. What Goes Into an Employee Handbook? Like every company, every employee handbook is different. You can't simply photocopy another company's handbook and distribute it to your employees. A good employee handbook defines your unique workplace rules and practices, and should be written in a voice that reflects your vision and the culture you've built — or want to build. That said most employee handbooks include similar topics and types of information. Below is a look at eight common sections in employee handbooks. In order to be successful, your employees have to be in alignment with your company's values, missions, and goals. That's why you need to lay out those aims at the beginning of your employee handbook. All you need to do is provide a statement that encompasses what matters most to you as a company. For example, successful online shoe retailer Zappos names 10 Zappos Family Core Values that it expects employees to aspire to, including “Embrace and Drive Change" and “Be Passionate and Determined." Keep in mind that some of this material, such as overtime pay rules and workers' compensation coverage, are at least somewhat dictated by federal and state or even local laws. It's important to list all of the current federal, state, and local laws that are pertinent to your workforce. These can include equal employment opportunity, anti-harassment, and anti-discrimination laws. As should not be a surprise to you, the employee benefits section is one of the most frequently referenced sections of your employee handbook. Your handbook likely won't describe all the specifics of, say, your health insurance plan, as those can be quite detailed (and that information can be provided separately). But you probably want to give the basics: When is an employee eligible to enroll in the company health plan and how many options do you offer: types of plans, family coverage? When is the annual open enrollment period? Because your employees will often reference this section — who doesn't like to find out about on-the-job perks? — use it to your advantage and help them fully understand all they get as part of working for your company. Not every company includes this section, but companies that work in highly competitive industries with trade secrets and concern about employees jumping ship for a competitor may want to have employees sign a non-disclosure agreement or at least include a conflict of interest policy in the employee handbook. It's important that your employees understand the risks of not following the policies, laws, and procedures that you lay out in the employee handbook. Consider having a section that explains that they will be held accountable for their actions and behavior. You want employees to see that they’re receiving fair treatment and that all employees are subject to the same disciplinary process. It's important that your employees don't treat your employee handbook like a contractual agreement between you and them — which would mean they could sue you if the policies and procedures within the handbook aren't upheld. Thus, be sure to include a disclaimer that states the employee handbook is not a contract, to protect you against such concerns. As you start thinking about and planning out your employee handbook, you might realize that you haven't formalized many of your policies or that you still need to consider more thoughtfully what some of your policies should be. Don't worry — this is completely natural. Many small companies don't think concretely about their policies until they have to explain them in writing. Here are four steps you can take to begin the process of creating your employee handbook. A good place to start when thinking about your employee policies — whether specific to your attendance rules, your dress code, or your performance review process — is to think about your company's culture and values. As the small business owner, think about your personal values and what you want to emphasize. Also consider how you can create a value system and culture that will motivate your employees to do their best and stay with your company long-term. The culture you want to create should guide your policies and procedures — so it makes sense to at least draft a basic mission statement before designing your company's employee policies and procedures. With your values clearly identified, then think about creating policies that your employees will embrace. For example, companies looking to attract younger workers often don't want to give the impression of being too strict or overbearing — as it may turn off the millennial workers seeking workplaces that promote flexibility and openness. That said you might — out of necessity — have to be strict about certain policies. For example, if you run a business such as retail store where showing up to work on time is of utmost importance, you'll, of course, need to specify your attendance rules and perhaps your dress code. You then may be able to be more accommodating or generous in other parts of your workplace practices, such as by providing your employees with more vacation time. 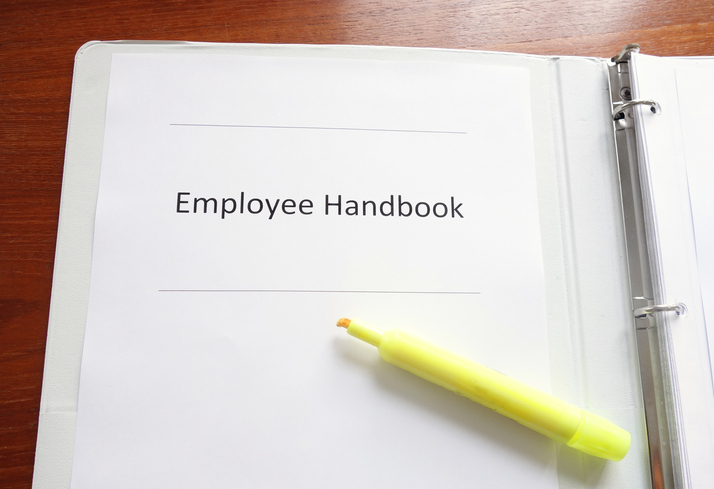 While the employee handbook is not a contract with your employees, it does set their expectations, so you must follow federal, state, and local laws when preparing certain parts of your employee handbook. For example, many states have passed “leave laws" that govern how employers must handle certain types of leave, whether that's sick leave or jury duty. They may even have boilerplate language that companies can use to describe those laws to their employees. You should be able to find descriptions of your state's laws online. You should be able to find detailed descriptions of your state's laws on your state government's website. The Employment Law Handbook by The Lunt Group also provides links to a wide variety of both federal and state legal resources, including a state-by-state breakdown of employment and labor laws. While you shouldn't copy other companies' policies and employee handbooks word-for-word, it's well worth your time to look through some of them for inspiration or ideas. You may already have access to other company's handbooks through friends or relatives. Take advantage of opportunities to check out at least a few other handbooks as you're planning out your policies and procedures. You can also find sample employee handbooks through a basic Google search.